Home Tags Posts tagged with "ultra-Orthodox extremism"
Thousands of people have rallied this evening in the Israeli town of Beit Shemesh against ultra-Orthodox Jewish extremism. Today protest follows two days of clashes after an 8-year-old girl said she had been harassed on her way to school. Some ultra-Orthodox in Beit Shemesh are seeking to segregate men and women. Shimon Peres said the demonstration was a defense of the “character” of the state of Israel “against a minority which breaks our national solidarity”. Opposition leader Tzipi Livni also condemned “the extremist elements that are rearing their heads and are trying to impose their world view on us”. Protesters, some holding signs reading “Free Israel from religious coercion” and “Stop Israel from becoming Iran”, gathered on Tuesday evening. Anger spilled over after an 8-year-old American girl, Naama Margolese, said she was afraid to walk to school in the town because ultra-Orthodox men shouted at her. “When I walk to school in the morning, I used to get a tummy ache because I was so scared… that they were going to stand and start yelling and spitting,” Naama Margolese said in a subsequent interview with The Associated Press on Monday. Other women have reported similar incidents in the town of 100,000, some 18 miles (30km) south-west of Jerusalem. Sarit Ramon described the situation in the town, where religiously observant immigrants live alongside Israelis embracing a more modern lifestyle, as having been “catastrophic for years”. “When I told that I was spat at a year and a half ago, people raised an eyebrow, and that was about it,” she told Reuters. Alisa Coleman told the BBC that she had been called a prostitute when dressed in a short-sleeved T-shirt and a skirt. Though underlining that this behavior was carried out by only a tiny proportion of the community, she said what was happening in Beit Shemesh was “a microcosm of what’s happening in the whole country”. 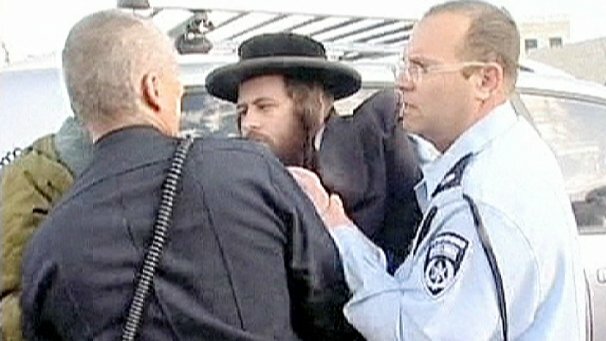 On Monday, one police officer was slightly hurt and a number of Orthodox Jews were detained after a group of some 300 ultra-Orthodox residents pelted police with stones and eggs in an incident reportedly triggered after police tried to remove a sign ordering segregation. A television crew attempting to film in the town were surrounded and harassed – the second alleged attack on journalists in as many days. On Sunday, a crew from Channel 2 news, which originally aired Naama Margolese’s story, was attacked as they were filming, say reports, with rocks allegedly thrown at their van. After Monday’s clashes, unnamed ultra-Orthodox activists from Beit Shemesh issued a statement condemning the violence, but also accusing the media of initiating “deliberate provocations in order to make the peaceful, quiet and tolerant residents, who live their lives according to their beliefs, look bad”. Such clashes have become more frequent in Israel in recent years as the authorities have challenged efforts by ultra-Orthodox Jews to segregate women in public places. Ultra-Orthodox Jews make up 10% of the population in Israel. The community has a high birth rate and is growing rapidly.